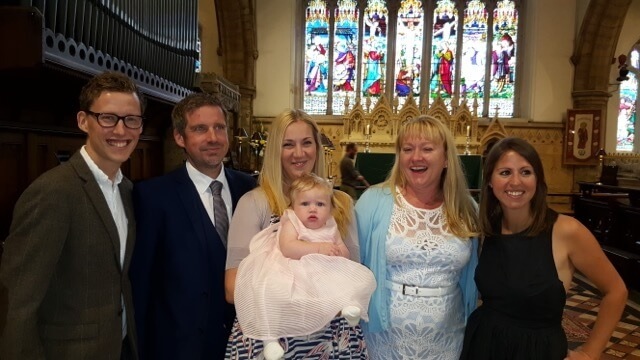 Please contact the Church Office, who will be delighted to hear from you and to help you make arrangements to have your child Christened – or “Baptised”, which is another word for the same thing. Both words describe God’s loving welcome into the family of His Church, for which there is of course no charge or fee to pay! In Horsham we arrange for Baptisms to take place in the Parish Church nearest to where you live, so that one of the first questions you will be asked is for your current home address. (An exception to this concerns our church members who are on the electoral roll at St. Mary’s – who of course can expect the ceremony to be conducted within their own Church family, regardless of address). If you live in the St. Mary’s pastoral area of our parish, we will then fix a date with you for the Baptism to take place (usually at 11.30am in Church, on a Sunday that we agree together). If you live in another area of the Parish we will normally give you the contact details of that Vicar & Parish Church, so you can make separate arrangements with them. The first thing to happen will be that you are contacted by a member of the St. Mary’s Baptism Visiting Team, who will arrange to meet you at home – who are church members pleased to answer any questions about bringing up your child at St. Mary’s and to explain more about the meaning of Baptism, and they will give you a Baptism Form to complete and return to the Church Office. The Baptism Visitor will also invite you to one of our popular “Kairos” services (designed especially for young families), which takes place at 11.30am on the 2nd and 4th Sunday of the month – at which the Visitor will ensure that you and your family receive a warm welcome. You will also be invited by the Church Office to an informal “First Steps” Baptism Preparation Session, which is held over brunch on a Saturday morning (10.00 to 11.15). This session explores further the meaning of Baptism (and also the alternative option of a Service of Thanksgiving), and also explains all that St. Mary’s has to offer for children and young families. Together with other Baptism families you will have a chance to meet the clergy who will conduct your service, as well as our St. Mary’s Children & Families Worker, and to ask any questions you wish. A creche is provided and the session finishes with prayers for you & your children around the font together. Finally, nearer the date of the Baptism, you will be contacted by the Minister who will be conducting the service – who will want to visit to get to know you as a family, to talk through the details of the Baptism Service itself, and what it means to belong to the wider Church family of St. Mary’s. We look forward very much to welcoming you and celebrating with your family!